Mobile App Link To My Daily Blogs. 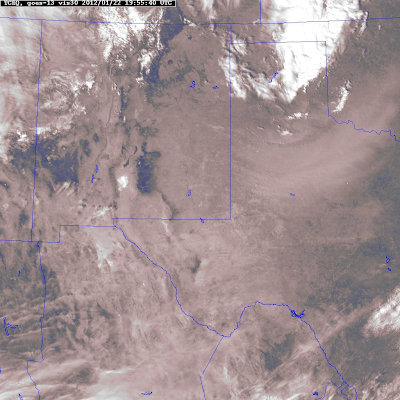 Visible Satellite Image Of The Blowing Dust At 12:55 PM MST. 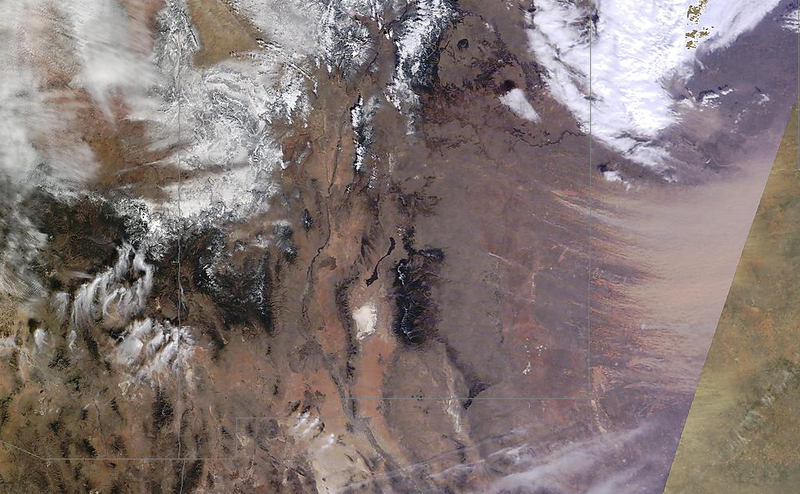 Today's MODIS Image Of The Blowing Dust. 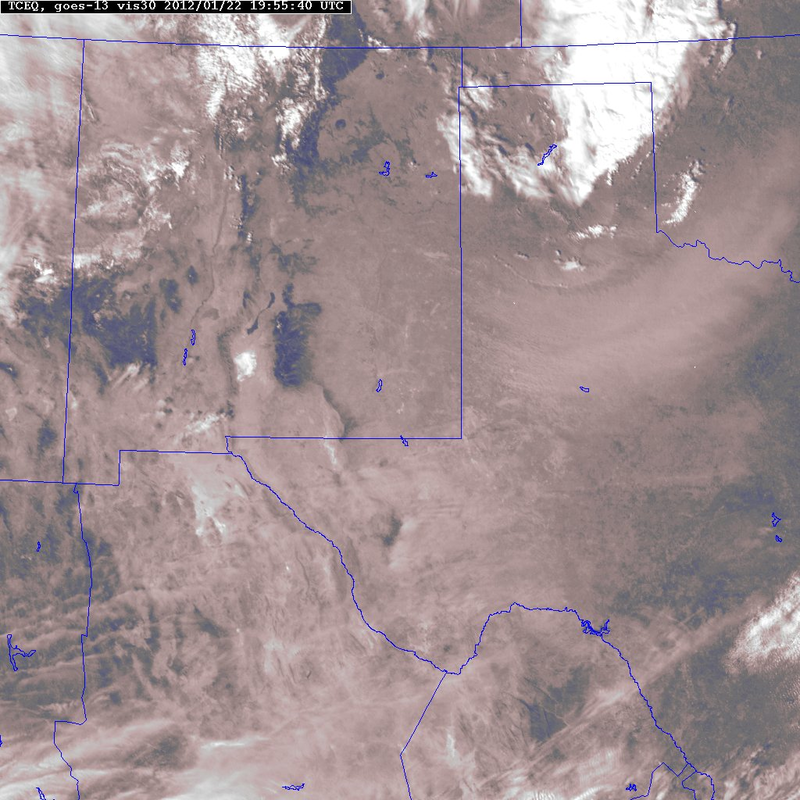 Dangerous High Wind -Blowing Dust Event Underway. 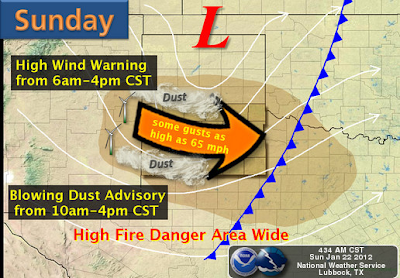 Dangerous Fire Wx Conditions Today! Blog updated at 2:13 PM MST. 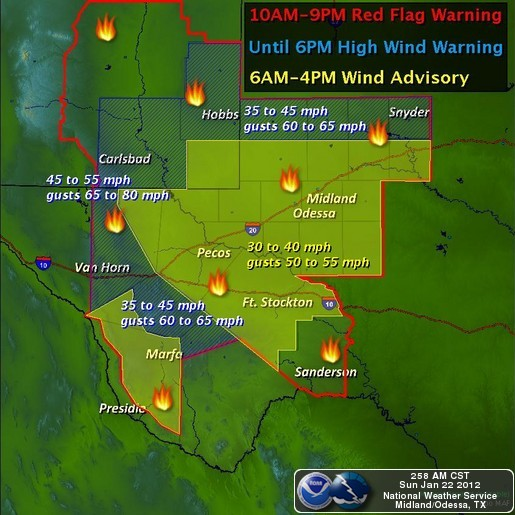 High Wind Warnings cover most of SE NM and W TX early this morning, except for Chaves County which is under a Wind Advisory. 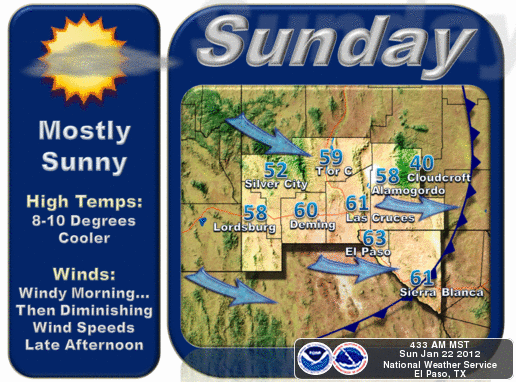 West-northwest winds are forecast to howl at sustained speeds of around 35-45 mph with gusts to near or over 60 mph across the lower elevations of SE NM today. These winds are forecast to gust up over 70-80 mph in the mountains. The strongest winds may occur between sunrise and around noontime when the Pacific cold front sweeps eastward across the area. Critically Dangerous Fire Weather Conditions will exists across all of the area today. 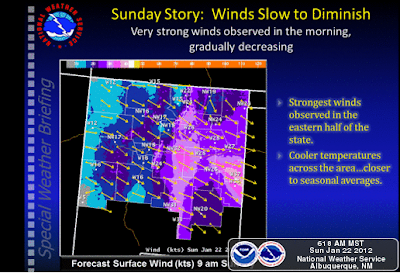 Any wildfire that should break out will have the potential to rapidly spread and grow in the high winds. 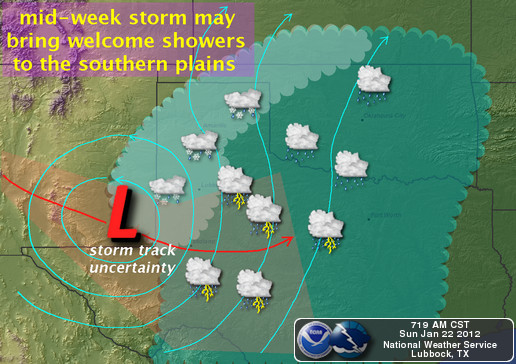 Please refrain from any type of outdoor activity that involves the use of sparks or flame. A Blowing Dust Advisory remains in effect for Lea County until 3 PM MST. 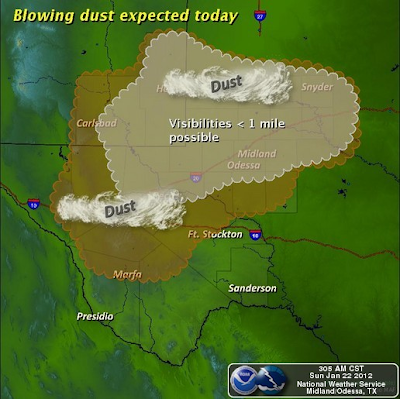 Blowing dust will reduce the visibility down to less than 3 miles in some areas, when a few areas possibly experiencing visibility drops down to less than one mile in the stronger wind gusts. This will be especially true over and near freshly plowed or exposed farmland, fields, lots, and construction sites, as well as other normally dust prone areas. 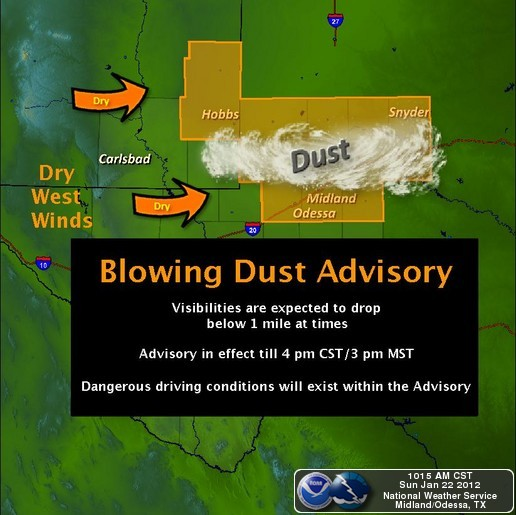 Travel on local roadways could be impacted today due to the high winds and blowing dust! 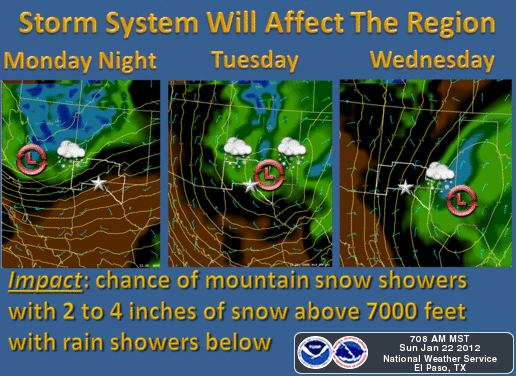 Some local road closures may be possible.